St Philip's first opened in September 1987 and quickly established itself as a popular and successful school, growing from an initial forty five children on role to its current size of four hundred plus within a very short space of time. 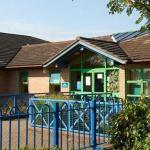 The school's popularity and success is due to a number of factors but primarily (according to parental feedback) due to our broad and rich curriculum provision and our emphasis on the development of the whole child. Parents state that the school provides a caring Christian environment which supports and encourages to succeed. Information taken from St Philip CE Primary School website. St. Philip (Westbrook) CEA Primary School is an inclusive school which believes in supporting all children to be the best that they can be. Our aim is to create a community based on Christian Values where all children can learn and develop. Our Christian Values underpin our teaching and learning and our Behaviour Policy. We recognise the importance of emotional, physical and spiritual development; our Mission Statement is 'Together we aim high and with God's love we can fly'. Speech and language screening takes place in the Foundation Stage to enable early identification of needs in this area. As well as this, Progress of all individual children is continually monitored. If the class teacher or teaching assistant is concerned about the progress of any child, then these concerns will be discussed at class level initially with the child's parents/carers. If appropriate, the class teacher may then involve the school's SEND co-ordinator and a programme of support may be put in place (parents/carers continue to be involved throughout this process). Provision and intervention is allocated for a fixed term and then reviewed. If the child is still not making the expected progress, then school may seek further advice and possibly assessment from outside agencies. The aim of this will be to enable the child to overcome any barriers to learning and continue to make progress. In the first instance, the child's class teacher is always the immediate point of contact. The class teacher (with the SENCo if appropriate) will discuss and plan the child's education plan with the parents/carers and where possible the child. The effectiveness of this will be monitored over an agreed period of time and progress will be reviewed at least termly. The class teacher will continue to monitor the child's progress and keep parents/carers informed regarding their child's progress. The school SENCo will also be kept informed as appropriate. The School Governors will continue to monitor the progress of SEND children. We have an experienced SENCo who will work with your child's teacher and/or teaching assistant to develop a plan to support your child's identified needs. Where deemed necessary and appropriate, she will refer your child to outside agencies such as an Educational Psychologist, the Local Authority Inclusion Team or Speech and Language Therapy services. The process will be explained to you by your child's classteacher with the SENCo. Teachers plan and deliver differentiated lessons according to each child's needs. Children are grouped according to their needs and additional small group support is targeted according to need via the school provision mapping. Where necessary, Individual Education Plans are generated in consultation with parents/carers and children and these detail specific targets, resources and support on an individual basis. Class teachers share and review pupil progress with the parents/carers and child at regular intervals. As well as this, regular two-way contact may be maintained using the child's personal Planner. Communication between home and school is encouraged and parents/carers may seek further reviews with class teachers and/or the SENCo if the need arises. Progress of children with an IEP is reviewed more frequently and ways in which parents/carers can support children at home will be discussed. Children with a Statement or EHCP have a formal Annual Review of Statement/EHCP. St. Philip's has a positive behaviour policy based on the Christian Values which encourages children to seek the best from themselves and encourage others. Some children may be mentored on an individual basis if this is seen as contributing to their emotional and/or behavioural well-being. If a child has a medical need school will liaise with the School Health Advisor to ensure that staff are well-informed regarding the child's needs. Additional specialist services may be consulted if the school deemed this to be necessary. The school SENCo attends regular training and up-dating sessions led by the Local Authority. information regarding local and national provisiojn for children with SEND is shared as appropriate through whole staff or individual inset. School endeavours to include all children in all activities and works closely with parents/carers to ensure that wherever possible barriers to participation are removed. Risk assessments for individuals are put in place as appropriate and these are shared with parents/carers to ensure that the correct provision is in place. The school building is accessible by wheelchair and there is one disabled toilet. the school car park has a designated disabled parking bay. Further adjustments are made according to need through provision mapping, for example for children with a visual or hearing disability. School liaises with pre-school settings and parents/carers before children start school. Children moving between year groups and/or Key Stages are supported through visits and/or Transition Booklets. Careful programmes of transition are put in place for children moving to Secondary Education and St. Philip works closely with Great Sankey High School and other educational settings to ensure smooth transition for all children. Meetings are held between staff, and parents/carers where appropritate to share knowledge, data, progress and any other relevant information so that a complete picture of each child is shared. Provision mapping identifies categories of need on an individual, class and whole school basis. Funds are allocated to best meet the needs of children, and spending is regularly reviewed to ensure that the best practice and support are in place. Following detailed assessment of the child, the class teacher, in consultation with the school SENCo decides on the nature and regularity of support needed for a child with SEND needs. This support may be as part of a small group or possibly on a one to one basis. Support is reviewed regularly with parents and may change according to the ongoing needs of the child.